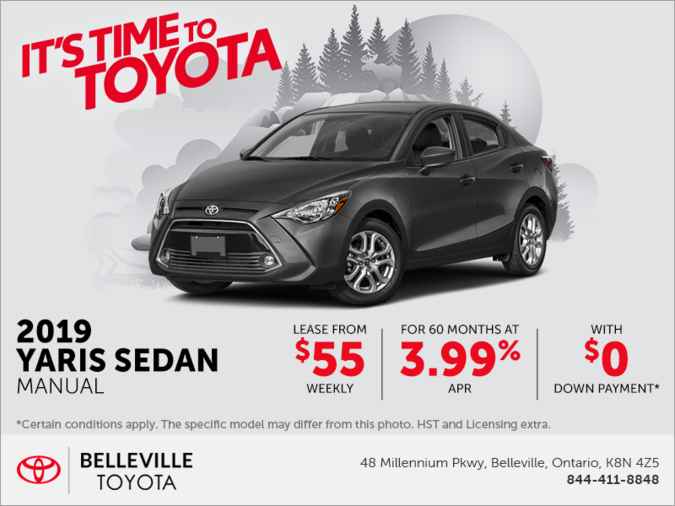 Lease the 2019 Toyota Yaris Sedan starting from $55 weekly at 3.99% for up to 60 months with $0 down! Your local dealer may charge additional fees of up to $989. Dealer Fees may be added and may be comprised of administration/documentation fees, VIN Etching, anti-theft products, cold weather packages or other fees. Fees may vary by Dealer. Limited time lease and finance offers available from Toyota Financial Services on approved credit. *All-in price of a new 2019 Corolla CE CVT (BURCEC"B") / 2019 Camry LE (B11HLT"V") / 2018 RAV4 FWD LE (ZFREVT”B”) / 2019 Sienna 7-Passenger V6 (ZZ3DCT”A”) / 2019 Tacoma 4X4 Access Cab SR5 (SX5ENT”A”) / 2019 Tundra 4X4 Double Cab SR 5.7L TRD Off-road Package (UM5F1T”C”) /2019 Yaris Sedan XLE 6AT (BT5K3P”A”) / 2019 Yaris 5-DR SE Hatchback Manual (KTUS3M”A”) / 2019 Prius C (KDTA3P”B”) / 2019 Tacoma 4x4 Double Cab V6 TRD Sport (DZ5BNT”B”) / 2019 Tundra Double Cab SR5 Plus 5.7L (UY5F1T”B”) / 2019 Camry Hybrid LE (B31HLT”A”) / 2019 Avalon XSE (BZ1FRT”A”) / 2019 RAV4 Hybrid LE (RJREVC”A”) / 2019 Highlander FWD LE (ZZRFHT”A”) / 2019 Highlander Hybrid XLE (JGRFHC”A”) / 2019 4Runner SR5 (BU5JRa”B”) / 2019 Sequoia SR 5.7L (BY5G1T”A”) / 2019 Corolla Hatchback S (K4RBEM”A”) / 2019 86 Manual (ZNAA1M”A”) / 2019 C-HR LE (KHMBXC”A”) is $22,159 / $28,374 / $29,704 / $37,249 / $39,794 /$41,944 / $18,354 / $17,289 / $24,144 / $44,424 / $46,959 / $33,434 /$44,674 / $36,744 / $39,254 / $52,904 / $48,109 / $63,319 / $22,764 / $31,874 / $25,629. All-in price includes freight and fees (PDE, EHF, OMVIC fee and air condition tax, where applicable). HST, licensing, registration and insurance are extra. Dealer may sell for less. †2.49% / 4.49% / 1.99% / 4.99% / 4.49% / 2.99% / 2.99% / 2.99% / 3.49% / 4.99% / 2.99% / 4.49% / 5.29% / 1.99% / 3.99% / 4.99% /5.09% / 4.49% / 4.99% / 3.49% / 4.49% / 1.99% purchase finance APR on a new 2019 Corolla CE CVT (BURCEC"B") / 2019 Camry LE (B11HLT"V") / 2018 RAV4 FWD LE (ZFREVT”B”) / 2019 Sienna 7-Passenger V6 (ZZ3DCT”A”) / 2019 Tacoma 4X4 Access Cab SR5 (SX5ENT”A”) / 2019 Tundra 4X4 Double Cab SR 5.7L TRD Off-road Package (UM5F1T”C”) /2019 Yaris Sedan XLE 6AT (BT5K3P”A”) / 2019 Yaris 5-DR SE Hatchback Manual (KTUS3M”A”) / 2019 Prius C (KDTA3P”B”) / 2019 Tacoma 4x4 Double Cab V6 TRD Sport (DZ5BNT”B”) / 2019 Tundra Double Cab SR5 Plus 5.7L (UY5F1T”B”) / 2019 Camry Hybrid LE (B31HLT”A”) / 2019 Avalon XSE (BZ1FRT”A”) / 2019 RAV4 Hybrid LE (RJREVC”A”) / 2019 Highlander FWD LE (ZZRFHT”A”) / 2019 Highlander Hybrid XLE (JGRFHC”A”) / 2019 4Runner SR5 (BU5JRa”B”) / 2019 Sequoia SR 5.7L (BY5G1T”A”) / 2019 Corolla Hatchback S (K4RBEM”A”) / 2019 86 Manual (ZNAA1M”A”) / 2019 C-HR LE (KHMBXC”A”) for 60 / 60 / 60 / 60 / 60 / 60 / 60 / 60 / 60 / 60 / 60 / 60 / 60 / 60 / 60 / 60 / 60 / 60 / 60 / 60/ 60/ 60 months equals a weekly payment of $89 / $122 / $118 / $162 / $173 / $174 / $76 / $72 / $101 / $193 / $206 / $144 / $196 / $149 / $167 / $230 / $210 / $276 / $96 / $139 / $104 for 260 / 260 / 260 / 260 /260 / 260 / 260 / 260 / 260 / 260 / 260 / 260 /260 / 260 / 260 / 260 / 260 / 260 / 260 / 260 / 260/ 260 weekly payments with a down payment or trade equivalent of $0 / $0 / $0 / $0 / $0 / $0 / $0 / $0 / $0 / $0 / $0 / $0 / $0 / $0 / $0 / $0 / $0 / $0 / $0 / $0 / $0 / $0 when you apply the $500 / $0 / $500 / $0 / $0 / $0 / $0 / $0 / $0 / $0 / $0 / $0 / $0 / $0 / $0 / $0 / $0 / $0 / $0 / $0 / $0 / $0 Customer Incentive. Cost of borrowing is 1,398.69 / $3,356.90 / $1,501 / $4,916.86 / $5,353,80 / $3,859.59 / $1,428.96 / $1,346 / $2,202.82 / $5863.95 / $3,859.59 / $3,955.54 / $6,266 / $1,888.77 / $4,110.72 / $6,983 / $6,482.69 / $8,358 / $2,076.91 / $3,779.98 / $1,317 for total obligation of $22,159 / $31,731 / $31,205 / $42,166 / $45,046.97 / $45,209.73 / $19,783 / $18,635 / $26,346.99 / $50,288 / $53,433.76 / $37,389.71 / $50,940 / $38,632.94 / $43,364.89 / $59,887 / $54,591.86 / $71,677 / $24,841 / $35,645 / $26,946. All-in finance includes freight and fees (PDE, EHF, OMVIC fee and air condition tax, where applicable). HST, licensing, registration and insurance are extra. Dealer may sell for less. ‡1.49% / 4.99% / 1.99% / 5.59% / 5.59% / 3.99% / 3.99% / 2.99% / 3.99% / 1.99% / 5.59% / 3.99% / 4.99% / 5.49% / 1.99% / 4.99% / 5.99% / 5.29% / 3.99% / 4.49% / 2.49% lease APR on a new 2019 Corolla CE CVT (BURCEC"B") / 2019 Camry LE (B11HLT"V") / 2018 RAV4 FWD LE (ZFREVT”B”) / 2019 Sienna 7-Passenger V6 (ZZ3DCT”A”) / 2019 Tacoma 4X4 Access Cab SR5 (SX5ENT”A”) / 2019 Tundra 4X4 Double Cab SR 5.7L TRD Off-road Package (UM5F1T”C”) /2019 Yaris Sedan XLE 6AT (BT5K3P”A”) / 2019 Yaris 5-DR SE Hatchback Manual (KTUS3M”A”) / 2019 Prius C (KDTA3P”B”) / 2019 Tacoma 4x4 Double Cab V6 TRD Sport (DZ5BNT”B”) / 2019 Tundra Double Cab SR5 Plus 5.7L (UY5F1T”B”) / 2019 Camry Hybrid LE (B31HLT”A”) / 2019 Avalon XSE (BZ1FRT”A”) / 2019 RAV4 Hybrid LE (RJREVC”A”) / 2019 Highlander FWD LE (ZZRFHT”A”) / 2019 Highlander Hybrid XLE (JGRFHC”A”) / 2019 4Runner SR5 (BU5JRa”B”) / 2019 Sequoia SR 5.7L (BY5G1T”A”) / 2019 Corolla Hatchback S (K4RBEM”A”) / 2019 86 Manual (ZNAA1M”A”) / 2019 C-HR LE (KHMBXC”A”) for 60 / 60 / 60 / 60 / 60 / 60 / 60 / 60 / 60 / 60 / 60 / 60 / 60 / 60 / 60 / 60 / 60 / 60 / 60 / 60 / 60 / 60 months, equals 260 / 260 / 260 / 260 / 260 / 260 / 260 / 260 / 260 / 260 / 260 / 260 / 260 / 260 / 260 / 260 / 260 / 260 / 260 / 260 / 260 / 260 / weekly payments of $55 / $89 / $79 / $118 / $112 / $141 / $55 / $52 / $72 / $105 / $113 / $119 / $106 / $138 / $100 / $117 / $170 / $141/ $188 / $65 / $98 / $6 with a $0 / $0 / $0 / $0 / $0 / $0 / $0 / $0 / $0 / $4,800 / $5,200 / $0 / $0 / $0 / $0 / $0 / $0 / $0 / $0 / $0 / $0 / $0 down payment or trade equivalent when you apply the $500 / $0 / $500 / $0 / $0 / $0 / $0 / $0 / $0 / $0 / $0 / $0 / $0 / $0 / $0 / $0 / $0 / $0 / $0 / $0/ $0 $0 Customer Incentive. First weekly payment due at lease inception. Total lease obligation of $14,920 / $23,140 / $21,134 / $30,678 / $29,128 / $32,112 / $14,370 / $13, 379 / $18,752 / $32,099 / $34,532 / $27,432 / $35,738 / $26,006 / $30,484 / $44,041 / $36,507 / $48,877/ $16, 926/ $25,365 / $17,678 . All-in lease includes freight and fees (PDE, EHF, OMVIC fee and air condition tax, where applicable). HST, licensing, registration and insurance are extra. Dealer may lease for less. Based on a maximum of 100,000KM / 100,000KM / 100,000KM / 100,000KM / 100,000KM / 100,000KM / 100,000KM / 100,000KM / 100,000KM / 100,000KM / 100,000KM / 100,000KM / 100,000KM / 100,000KM / 100,000KM / 100,000KM / 100,000KM / 100,000KM / 100,000KM / 100,000KM / 100,000KM / 100,000KM / 100,000KM. Additional KM charge of $0.07 / $0.10 / $0.10 / $0.10 / $0.10 / $0.10 / $0.07 / $0.07 / $0.07 / $0.10 / $0.10 / $0.10 / $0.10 / $0.15 / $0.10 / $0.15 / $0.15 / $0.15 / $0.15 / $0.07 / $0.10 / $0.10 for excess kilometres, if applicable. Offers are valid between February 1, 2019 and February 28, 2019 and are subject to change without notice. All rights are reserved. 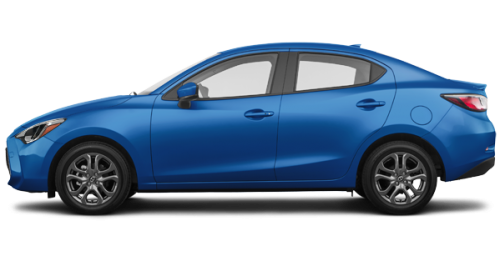 Dealer may lease or sell for less. Dealer order/trade may be required but may not be available in all circumstances. Some conditions apply. Please see your participating Ontario Toyota Dealer for full details.